Interviewing for project management jobs is something I have had to do but I don’t find it easy. How do you know what to ask? And how do you use what is normally a really short period of time to let the candidate show themselves in the best possible light? Added to that is the fact that it’s easy for candidates to come up with answers to many of the standard questions because there are so many books about recruiting and interviewing. They have plenty of time to rehearse their answers, so the whole thing can feel like a box ticking exercise. Scroll down to get a free template for conducting an interview. It’s an interviewer’s Cheat Sheet and it’s got all the questions pre-populated and it’s fully editable so you can customise with your own questions too. Then simply fill in the candidates answers during the interview. Using the same format for every candidate is important so you can more easily compare candidates and prove you have had a fair interview process. 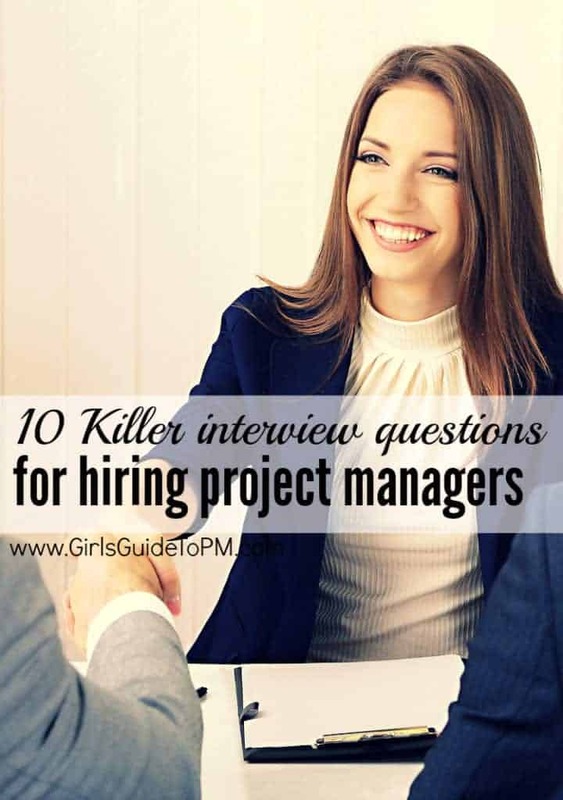 I’ve put together my 10 killer interview questions for hiring a project manager. Next time you have to recruit someone for your project team, why not try some of these? 1. What don’t you want to work on? Good because: There are always bits of jobs we don’t like, but project managers typically work on the projects that they are assigned. It’s fine to have preferences, but you’re looking for someone who can respond to business needs even if that isn’t their top choice of project. Good because: This will show you how they value their career and whether they see themselves progressing in a PM role. Ask them why they chose that rating. 3. What’s the most important thing for a project manager to do? Good because: It will show you their priorities and whether they have actually thought about what a project manager does. It will also demonstrate whether they are a good cultural fit for your team. If you have a strong focus on process and they think the most important thing is to be flexible and adapt processes as you go, then you probably won’t get on. Good because: This gives you an indication of how they do their job. Someone who spends all day at the PC may suit your environment, or you might be looking for a project manager who gets out and visits clients most days of the week. Remember that they might be prepared to do something other than what they do now, so if you hear something that doesn’t fit with the post you are recruiting for, don’t rule them out before exploring this further. 5. How do you work with sponsors? How do you manage up? Good because: Managing up means working well with people more senior than you. Project managers do this all the time, so it’s good to find out how they make those relationships work. 6. When was the last time you didn’t delegate and what happened? Good because: This will help you work out if they are happy to be honest and tell you about a time that something went wrong. This shows their capacity to learn from mistakes and how they deal with information overload. Knowing how to delegate work packages is key to project work and you’ll want to hire someone who understands that. 7. What was the most difficult ethical decision you’ve had to make on a project? Good because: It can demonstrate their awareness of PMI Code of Ethics and even if they aren’t aware of that, their general approach to work. You can also use it to open up an interesting discussion and allow you to judge how they will fit into your business culture. 8. What criteria are you using to find your next job? Good because: It will show you what’s important to them at work: green credentials, career progression, work/life balance, working for a big brand etc. It will also tell you if they are actively job hunting or whether they saw your ad and couldn’t resist (either is fine). 9. How have you improved project management processes at your current firm? Good because: Not everyone has the chance to work on business critical, exciting projects that make for a great CV, but everyone has the chance to offer some suggestions for improvements (even if they aren’t taken up). Look for someone who has ideas and who isn’t afraid to put them forward. 10. What creative problem solving techniques do you use? Good because: It’s worth probing the technical skills of candidates. Can they talk knowledgeably about fishbone diagrams, De Bono’s thinking hats, role play? Branch out to talk about the last project issue they resolved with creative thinking. by Andrew Makar is a good reference guide to the interview process and will help you feel prepared. You can also download my Interviewer’s Cheat Sheet: an editable Word document that you can use in your interviews to record responses from candidates. Enter your email below and get the file to save you time preparing for an interview. 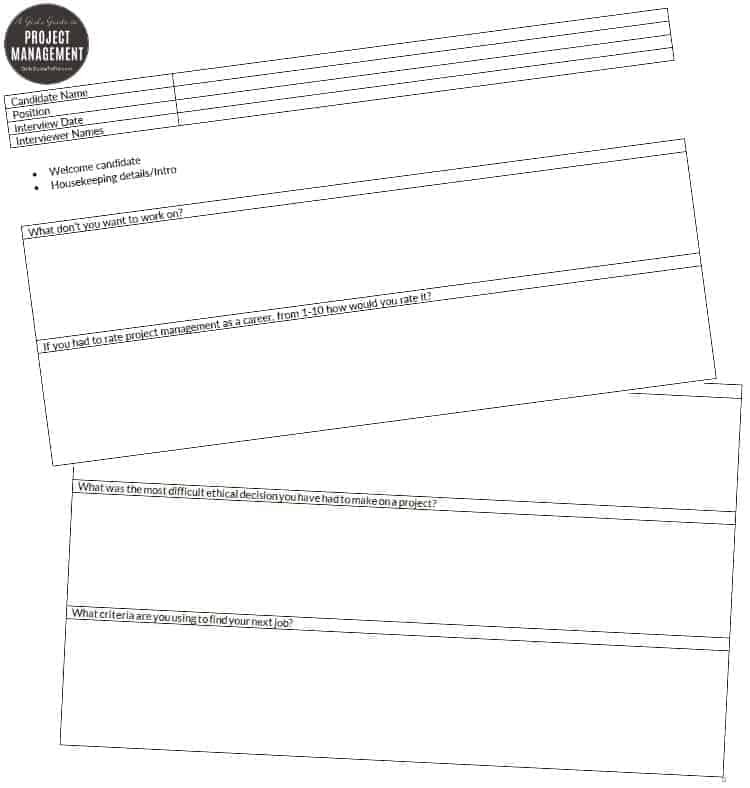 Sign up for our newsletter & receive the free interview template as an editable Word document. Filed Under: Build a Career, Templates Tagged With: This article contains affiliate links. Thanks for these valuable questions answers. Here I want to add two more questions i.e. what is the next step in the process? when do you think you will be making a decision? In the recent past, how has the company acknowledged and rewarded outstanding performance? Great Questions! Not only does it help the interviewer to know about the candidate’s working style and what they value, but also gives the candidate an idea of what the company values and the work culture of the place they are intending to work. Thanks, Shreya! Hope they are useful for you. I don’t like the questions very much, because from my experience they do not really focus on the right things. And the example answers are ridicolous. Nobody would answer “facebook”. I addtion, what is a useful question and what is not differs from project to project, and also what is a good answer. If you would like to provide more or less general questions, I would like to suggest to focus on something else than processes, career etc. Frankly, the topics from that questions do not relate to the challenges of our times, like fast moving targets, short-term thinking, constantly raising complexity, difference between project success and project management success, black swans etc. Questions should much more focus on the goals instead of tools and methodology. Example: what does mean to you beeing succesful and how doe you know if you are succesful? How do you deal with known unknowns vs. unknown unknowns? What is a complex project, how do you measure complexity and how do you approach it? I agree that no one would answer “Facebook” – that’s me being a bit flippant and using that as shorthand for any number of “wrong” answers in an attempt to be humorous, which obviously fell a bit flat. Questions and answers are specific to the role. It sounds as if they wouldn’t be suitable in your environment, and that’s fine. There are loads of alternatives on the internet and you have your own too. I wrote a few questions that I use when I interview PMs. No right or wrong answers given, just food for thought for others to pick and choose questions that will work for them. Thanks – I keep meaning to check out Medium more for publishing and haven’t quite got round to it yet. I appreciate you sharing your questions – the more prepared candidates are, the better! Yes, great questions thanks. 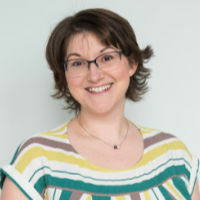 Along with ‘What’s the most important thing for a project manager to do?’ perhaps something along the lines of: ‘What shouldn’t project managers spend time doing?’ As I find that they often spend too much time on the wrong things. He he! Yes I’d love to ask an interviewee that one. These are brilliant interview questions! No,. 6 is an especially smart way to get insight into someone, as well as an intriguing question for the interviewee. I’m definitely going to use #8, too. Thanks for these! Glad you enjoyed it – hope you get some great candidates when you use them in your interviews! These questions also make it easier to evaluate candidates as a group and rank them in order to who would be the best fit for the business. If you end up chatting about different things with each person it becomes difficult to assess them objectively. A standard list makes the interview more ‘clinical’ but it’s better and fairer for everyone.